It is a natural desire of every person to have beautiful and smooth skin. The state of your skin depends on such factors as ecological conditions, your own genetic heritage and especially your lifestyle. No matter what problems you may have with your skin - acne, blemishes, pigmentary spots - they are the visible effects of your internal state. So, along with beginning a daily skin care regimen, you need to - improve your dietary habits. Following a proper raw food diet will not only make you healthier, but it will change your look, make you feel more confident, add glow to your skin and put a healthy sparkle in your eyes. Let's begin with internal changes in your body, because they definitely influence your appearance. When you embark on the raw food diet and lifestyle, be sure to educate yourself about your new way of life. First - theory, second - practice! The best place to begin is with my first book "Your Right to be Beautiful" where you can find much in depth and scientific information to begin educating yourself about the various aspects of the raw food diet that will allow you to become healthier, more attractive, and more confident! You can do this no matter what your age! Reading my story will inspire you to improve yourself! 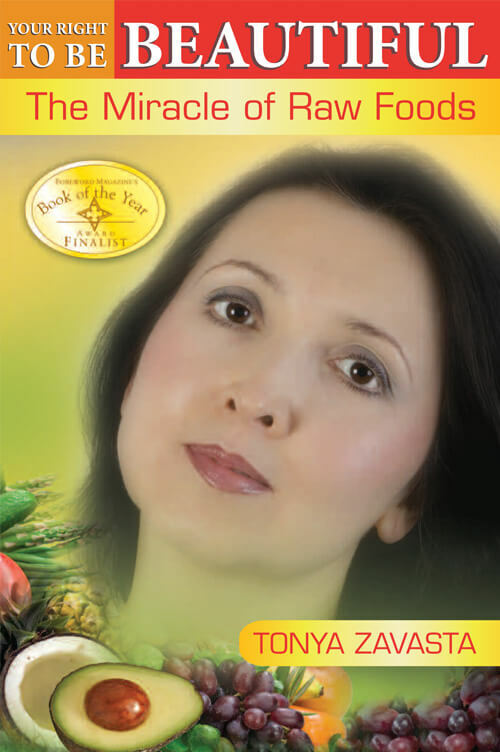 This book will help you to understand the "why's" of changing to a raw food diet. Learn more about Your Right to Be Beautiful. Once you have made up your mind to completely change your habits and become 100% raw, you will need creative recipes and inspiration. You will find this and more in my second book "Beautiful on Raw: Uncooked Creations." 100 delicious raw food recipes ranging from juices, salads, and soups to such culinary masterpieces as lasagna, "sushi" rolls and even burgers. I haven't forgotten about dessert lovers! You will find mouthwatering recipes for cakes, snacks and even more. There are also interviews with several beautiful and courageous women who share the inspiring stories of their raw food transformations. 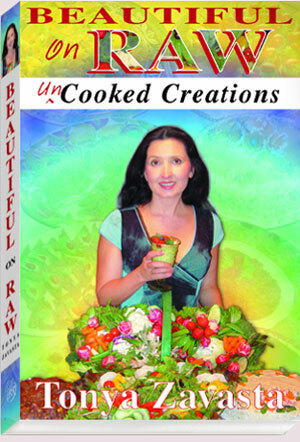 Learn more about Beautiful on Raw: Uncooked Creations. To assist you with your transition, you will learn the how's of switching easily and painlessly to the raw foods diet from the e-book entitled "100 Days to 100% Raw." It will guide you step by step to a whole new you! Having a road map will help you to follow through with your decision and arrive at your destination without giving up. It may be hard and challenging but you are not alone on the road to the ideal you! 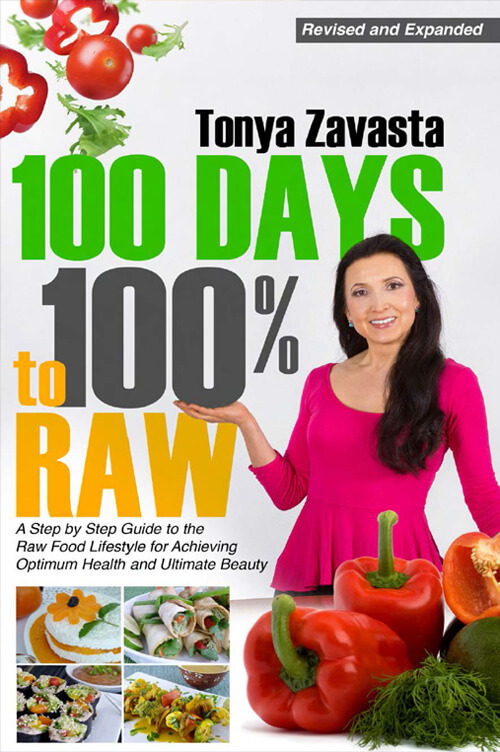 Learn more about 100 Days to 100% Raw. Once you have stabilized on the raw food diet and lifestyle, the revolutionary book “Quantum Eating” will be your new constant companion as you proceed along the super health highway. The book itself is very scientific but understandable for everyone. You will find answers to many questions about the functioning of your body, about the processes that go on when you eat, and how all of your health practices influence your appearance and long-term state of health. 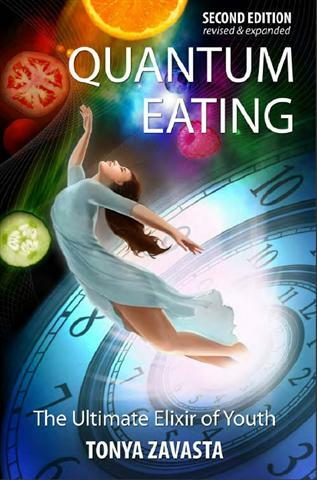 Learn more about Quantum Eating: Ultimate Elixir of Health. Here is an excerpt from Quantum Eating, chapter 35: Show Your Glow; Striving for Perfection in Complexion: "Your skin's condition reflects your internal health. Skin problems like acne, blemishes, and dryness are signs of an overtaxed system. Just as deficiency and toxicity are the main two causes of illness, they tend to be the same two causes for most beauty problems as well. Poor elimination and poor circulation are two major causes of negative skin conditions. A raw food regimen definitely takes care of poor elimination. But correcting your poor circulation can use some external help." When your system gets overloaded, your body can't eliminate all of its waste through regular channels. Skin eruptions are excretions of waste materials from the pores as well as dry, oily, or sensitive skin, acne, and facial blemishes all result from gut problems, so they do have to be addressed internally. At the same time, you shouldn't ignore external measures that can help you. When you comprehend how inner health can affect outer beauty, you will be able to take conscious and deliberate action. RejuvaRoll. There is always room for improvement. You know that the circulation of your blood is vital to all bodily processes. Sluggish circulation compromises health and beauty alike. You can change this situation with the Skin Rejuvenator “RejuvaRoll”. Use as directed on your face and throughout your body and you will notice wonderful healing effects due to the 5 metals which the pins are made from. You need only 5 minutes per day to make your skin look rosy and young! The Violet Ray is an electric device that will help you to manage any serious problems you have with your skin. But it is extremely beneficial for healthy people, as well. What is so wonderful about this very unique device? It delivers ozone to your cells which joins with harmful bacteria and escorts them out of your body. Basically, the Violet Ray helps you with detoxification. Regular use of the Violet Ray, which enhances both circulation and detoxification, is an indispensable aid on your way to pure beauty! 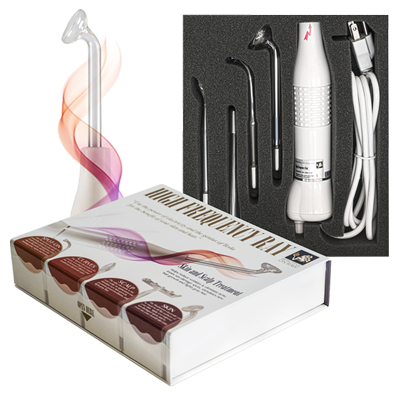 If you plan to use the Violet Ray quite often, share it with family members, and especially if you work in the beauty industry, you might prefer the more powerful Violet Ray - Professional Edition. It is the same as the original Violet Ray only better. It can help you to achieve more pronounced results in less amount of time! Learn more about The Violet Ray. For high-frequency skin and scalp treatments. Organic Facial Skin Care. Adhering to the raw foods diet can affect positive changes in the appearance of your face, but adopting a habit of facial exercises influences it even more! You might be undecided about whether to do them, thinking that they can stretch your muscles and worsen your general look. However, when you do physical exercises, your body looks more toned, slim and beautiful! The same happens to your face: if you train your facial muscles, your skin will become smoother and more elastic. 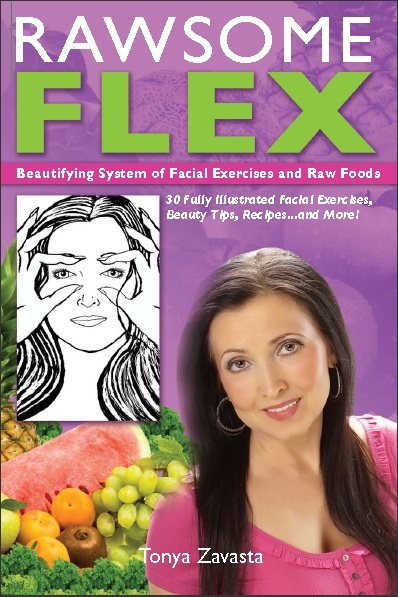 You can find the perfect system of facial exercises in "Rawsome Flex: Beautifying System of Facial Exercises and Raw Foods." All the exercises included in this book are selected and tested personally by me. And as you can see from the photos, this system definitely works and delivers great results. Learn more about Rawsome Flex. How can you drastically improve your appearance? Regular usage of my skin care products, which are made from raw materials, can considerably change the way you look. If you are used to having a bathroom filled with a variety of skin care products believing they are helpful, useful and effective you will be delighted to know that you need only two skin care cosmetic products that will change your appearance dramatically: one is for cleansing the skin, the other is for nourishing and moisturizing. Oragnic Facial Masque. Cleansing your face with pure water is insufficient. The world we live in nowadays is so polluted that harmful bacteria seem to be right in the air! In addition, metabolic byproducts leave our body through the skin. That is why it is so important to have clean and refined skin before you put your cream on. I am proud to present my very own unique formula in a wonderful masque, which will replace all other cleansing products you have. Multi-Herbal Green Clay Masque is made of raw materials specially formulated for multiple purposes which make this masque universal for all types of skin. You don't have to worry about your oily, dry or sensitive skin anymore. Multi-Herbal Green Clay Masque has components that will be right for all skin types. And in 5 minutes after application you can enjoy the wonderful effect - your skin is clean, hydrated, nourished and glowing! There is one more product which cleanses your skin - the Masque Removing Brush. It was designed specifically for this purpose, and that is why it's neither too rough, nor too soft - it's perfect for removing the Multi-Herbal Green Clay Masque ! In addition, it removes blemish-causing contaminants that cannot ordinarily be removed by washing. 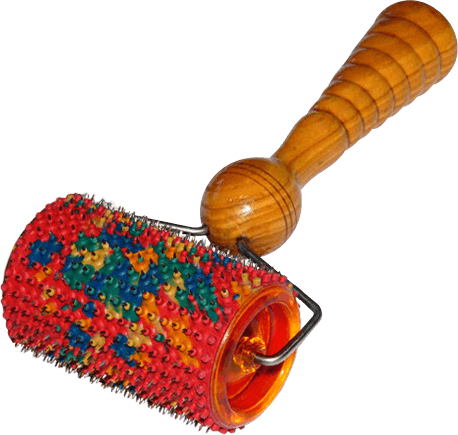 I want you to try this magic Masque Removing Brush so much that I am ready to give it to you for free! After removing the Multi-Herbal Green Clay Masque it is necessary to clean and polish your skin completely. Did you know that skin cells keep dividing until they touch nearby cells? That is why it is so important to remove the superfluous skin cells. You can do this with the custom designed Facial Brush for Glowing Complexion. It has all natural bristles and allows you to apply the perfect pressure. In this way you can be confident that you won't stretch or damage your skin while exfoliating properly. With the Facial Brush for Glowing Complexion polishing of your skin becomes a pleasure! 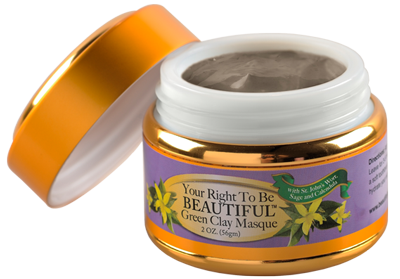 Learn more about about Your Right to Be Beautiful Multi-Herbal Green Clay Masque. Detox and invigorate your skin! 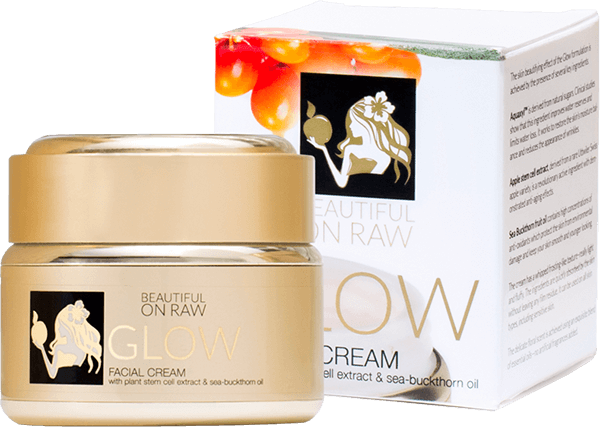 Now that your skin is clean and pure you are ready to apply Beautiful on Raw Facial Cream which will show your real beauty. It is made with raw materials and its formula has been perfected to achieve the best outcome. Beautiful on Raw Facial Cream will bring out the best your skin has and let it out! You might feel like you have brand-new skin - but it will only be the result of the raw food diet and the cream. Beautiful on Raw Facial Cream has a delicious vanilla scent, soft texture, and luxurious feel. And to top it all off it actually helps to heal your skin! So you get twice the benefits - healed and healthy skin that is also soft, smooth and glowing! Learn more about the "Glow" Facial Cream. With Sea Buckthorn oil for beautiful skin. 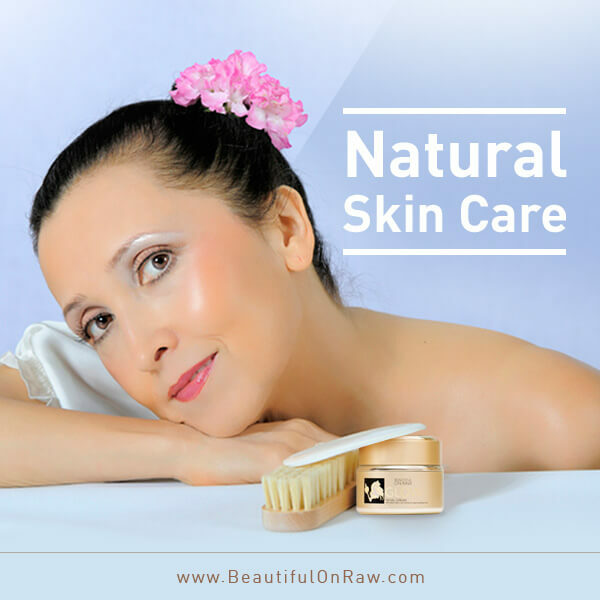 No matter what the condition of your skin now, I am sure that with these beauty products from Beautiful on Raw, you will be able to change your appearance for the better. Remember the two components of healthy and glowing skin: internal and external care. You are what you eat! Eating raw foods means being young and healthy, and as a result - having wonderful skin. Skin care products which you apply directly on your skin, consistently, will improve your look and grant you moisturizing and nourishing benefits all day long! Enjoy the pleasant feeling of healthy and glowing skin!